The life of a tradition mirrors the life of those who are living in it. 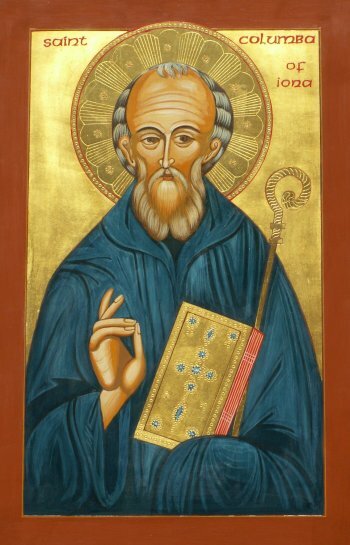 St. Columba was the force which brought the Celtic Christian tradition out of the comfort of its font of life in Ireland and into the marches and uncharted lands of pagan Pictland. He was a product of his time, a fierce and passionate Celt with an unwavering devotion to the imminent God of the tradition he was carrying. He was a man who was riddled with passions and pride, yet he was also able to embody the virtues of self-restraint and humility, but above all he was considered a saint by the people of his time and is remembered as a hero to the Celtic people. Like any proper hagiography from that period of time Columba’s story begins with a miraculous birth. His mother had a prophetic dream in which an angel came to her with a beautiful cloak which she held in her hands. After admiring its beauty for a short while it floated away and off to a far land across the sea. The angel told her it was a symbol for the son she would bear. It foretold Columba’s mission to convert many souls to the Christian faith. Prophesy was of the utmost importance to the Celts, and was a staple of Columba’s miracles. This prophesy, and its fulfillment, would be the basis for all of Columba’s life. The life of St Columba exemplifies the four aspects of the Celtic spiritual journey. His font of life began in the house of Cruithnechan who had baptized him and given him his first instructions in religious life and literary endeavours. However, it was Columba’s fate that the comfort of the font of life would not be a lengthy part of his journey. His path was a transformative one which not only explored the marches, but expanded the font of life to encompass them upon arrival, enlarging the circle as he went. However, before he was to explore the outer regions of his spiritual journey, he first had to experience the highs and lows of the mountains and valleys. It is fair to say that Columba had many extraordinary visions which could be considered mountain top experiences. The one that seems to be the most formative in his personal journey was the visitation from the three sisters which God gave to him for brides. When visited by his Guardian angel one night Columba was asked what gifts he would ask of God. Columba answered wisdom and purity. The angel was so pleased with his response that he foretold these two gifts would come to him as well as one more. Then, one day, three beautiful young women approached him, informed him they were the daughters of God, and promised themselves to him as his wives. The names of the sisters were purity, wisdom, and prophesy. This vison is what I have chosen to call Columba’s mountain top experience. It was an influential and life changing event in his life which set the tone for much of what was to come afterwards. Of all his visions this one spoke to his personal condition directly more than any other. It is also deeply symbolic of the merging of Celtic and Christian culture. The fact that women were the manifestation of these most highly prized virtues is evident of a Celtic understanding of divinity, which includes both genders. That Columba was to marry these girls, who were the daughters of Jesus, was a blending of Christian ascetic ideas of celibacy for monks and the importance of love and personal connection for the Celts. It could be said that these sisters were like Columba’s anam cara. He shared with them a deep and personal connection, yet they were not truly of this world, allowing for both the immimentalist ideas of the Celts and the new dualistic ideas of the Roman church. This mountaintop experience helped carry Columba out of his font of life and into his first exploration of the marches. After this experience he left Cruithnechan’s care and entered into monastic life as a deacon under the tutelage of St Finnian. Columba’s story was very much about the marches of life, and he would eventually go much further than this, but not until he had found his valley. While studying with Finnian Columba took it upon himself to copy one of Finnian’s psalters without permission. Finnian took great offense to this and sought legal retribution under the authority of High King Dermott. Dermott ruled in favour of Finnian and Columba was ordered to return the copied text to him. This finished psalter was of great value and took a considerable amount of time and skill to produce. The issue was contentious enough that Columba decided to defend the psalter, and his pride, by means of military action. Columba’s army defeated Dermott’s in a gory battle which cost the lives of thousands of men on both sides. Columba was then advised by one of his spiritual mentors that he must win back for Christ as many souls as were lost in the battle. This formative incident in Columba’s life is representative of the valley in many ways. Mainly because Columba is shown to have very human characteristics. Envy for the psalter which was not his, and a willingness to go to battle and sacrifice the lives of so many men to satisfy his pride are not the characteristics one expects to find in a saint. This personal failing surely must have been as much a devastation to Columba as the consequences of his actions which were to follow. Out of the valley Columba was again thrust into the marches, but this time much further out. His spiritual journey was to take him to pagan Pictland, to the west of his familiar font of life in Ireland. It was in the Kingdom of Dalriada, in Pictland, where Columba would fulfill the prophetic dream of his mother, bringing his story full circle and forging out of a hostile and foreign land the monastery which would become the hub of Celtic Christianity. This expansion into far reaching marches was not only a part of Columba’s personal journey, but of the Celtic people as whole. There are rare moments when one person’s life becomes completely entwined with the life of an entire culture and Columba, for a brief moment in history, embodied Celtic Christianity as they travelled together to the far reaches of uncharted territory. In a glorious feat of Providence the fate of one man changed the fate of an entire people. Celtic Christendom expanded its font of life into what was before the marches and the lonely island of Iona, which was the very fringe of the Celtic Christian world, became the center. Columba shows us some very crucial things which are still relevant today. He demonstrates the fine line between faith and arrogance, courage and belligerence, virtue and sin. He walks this fine line and touches feet down on both sides. Yet, most importantly, he shows us how imperfect people can still be tools for God’s purpose. In this we can see that our own shortcomings, our own folly, can be interwoven into God’s plan. He exemplifies that very Celtic view that our lives and the world around us are not separate from God’s world. We live and breathe in God’s grace and the very living of our lives is not separate from, or opposed to, Heaven. Columba was very much a part of this world and was subject to those human qualities that we all share yet he was a holy man and venerated saint. This paradox blurs the lines between sacred and secular and shows us that those distinctions are, in many ways, arbitrary. Next Post Who do we say God is?